We carry a large inventory of 304 and 316 stainless steel flanges in many types and sizes. Select from stainless pipe flanges such as: stainless steel blind plate flanges, stainless raised face blind flanges, stainless lap joint flanges, stainless steel slip on plate flanges, raised face socket weld flanges, raised face threaded flanges, raised face weld neck flanges, and raised face slip-on flanges. We also carry a line of iron flanges and gaskets kits in a variety of materials including rubber, non-asbestos and Teflon. We have an extensive inventory of multiple stainless steel flanges and aluminum flanges to compliment our pipe products. Most of our high quality, flanges and gasket kits are ready to ship upon request. Speak to one of our specialists and find out which flange products are available to meet your flange and piping specifications. View an overview of our stainless steel product offerings. We stock hundreds of high-quality stainless steel flanges to meet your needs and piping specifications. Take a look at our pipe flanges and flange gasket product dimensions. ANSI flanges meet ASTM-ASME A182 material specification and ASA B16.5 dimensional specification. View the standard specifications. Learn about our stainless steel inventory, functionality and application of our various grades of stainless steel. We engineered our product Reference Catalog for you to easily identify all of our products. The catalog includes specification charts and general dimensional illustrations to help you identify available and needed products. Learn more about theoretical bursting pressures for stainless steel pipe. 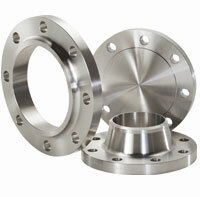 Many different types of stainless steel flanges can be incorporated into a piping system. Stainless steel flanges are highly resistant to rust, are much stronger and can out perform carbon steel flanges and provide much more corrosion resistance than your aluminum or steel flanges. ASME (American Society of Mechanical Engineers) flanges are engineered to meet certain standards. These standards are specified by the ASME and by the American National Standards Institute (ANSI). There are certain specifications in all flanges, each depending on the certain type of flange. This similarity ensures consistency with the same types of flanges used and replaced now and in the future.